Finely striated polycrystalline Djurleite crystals. They are very bright and are with Bornite and on Quartz. This sample was sold by us some years ago and analyzed at that time, so, we’ll send a copy of this analysis to the buyer. 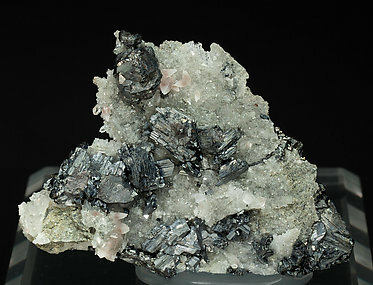 Group of crystals of Djurleite, an uncommon sulphide, with very well defined faces and edges and simple crystalline forms, whose surfaces show bluish reflections. 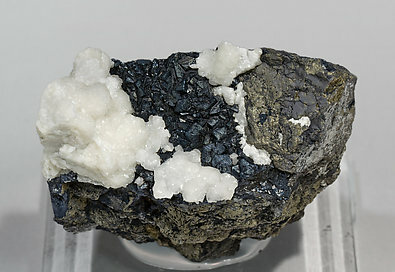 The group, on matrix, is partially coated by white crystals of Calcite. The sample has been analyzed and we will send a copy of the analysis to the buyer.